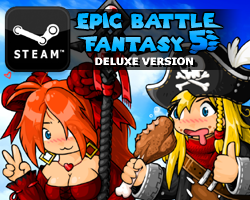 Here’s some new minibosses for the library dungeon in EBF5! I’m mostly transitioning to YouTube previews, but the Flash version is up on my DeviantArt. Let me know whether your prefer the Flash or YouTube versions. 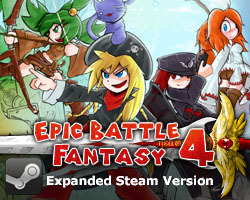 This entry was posted in Epic Battle Fantasy 5 on February 5, 2019 by Matt Roszak. I like both seeing as I usually see it first in my Youtube sub feed, then I head on over here and play with it to my hearts content. Eagerly looking forward to these. I wonder what element their attack will be) Probably mostly non-element, and weakness to fire? Yeah, from experience, these aren’t too hard, but I still loved their desing, and their battle. Glaurung looks like something from Heavy Metal. I prefer the youtube ones so you can save us the trouble from having to do it ourselves and just showcasing it easier, but whatever you like doing more. Also its things like this that remind me why your games are so good, I also love the way you can make bosses without having to sketch or design them first with just your sketched out idea and also how the kind of comic BOOM and BAM are written like action comics really shows how well versed you are in any form of art. How will we access this boss? A new dungeon?